But if you think this site was launched by seasoned Microsoft executives with deep channel connections and vendor funding, you couldn’t be farther from the truth. As young entrepreneurs, co-founders Adam Berezin and Jason Gumpert had no background in the Dynamics channel. But they saw a need and used a combination of research and tenacious determination to launch the first site of its kind in our space. It has been 10 years since they quit their day jobs to focus on the company full-time and grow it into the success it is today. Adam was inspired by lots of different people, but two in particular stand out. His grandfather, Charlie, was a very humble man who taught Adam that if you respect people, work hard and stay honest then success will come. The second, his father-in-law, Patrick, who Adam describes as one of the most brilliant and honest salespeople he’s ever met. Jason gives credit to his father, David, a successful entrepreneur who has been a business adviser and mentor to the team from the very start. Few young people would make the choice Adam did when he graduated from Wheaton college. He took what he describes as “the worst sales job in the world” cold calling and going door to door trying to convince business owners to switch their telecom providers. But he stuck with it because he reasoned that a business owner needs sales training and if he could master this job, he would be one step closer to his end goal. Eventually Adam moved to a position that involved creating lead generation programs for SAP partners. Around this time, he became aware that Microsoft had acquired several different ERP products and was trying to bring them all together under the Dynamics brand. He was intrigued, but he soon realized it was difficult to find an independent resource for information. And if he was having trouble finding information, then potential customers must also be frustrated. He wondered where potential Dynamics ERP customers could go for news. And how did ISVs and resellers generate leads? So, he decided to ask. Adam started cold calling and asked 40 Dynamics ISV partners how they generated leads. The overwhelming response was tradeshows and purchased lists. Adam knew he could provide alternatives that were less expensive and more effective, and a business idea was formed. But he admits that he still didn’t know anything about starting a business. So, he started asking anyone and everyone he could find. And what better place to find good business advice and future partners than a Harvard MBA alumni meeting. The trouble was that Adam didn’t attend Harvard. He found the person in charge and begged until they let him attend a meeting. That proved to be a turning point, because it led to his being introduced to Jason Gumpert. After graduating from Colby College, Jason worked as a software developer and an implementation consultant in the enterprise software space. When he met Adam, he was also looking for the next step in his career. It was obvious right away that the two were completely different, both in personality and in skill sets, but it was those differences that made it work. Adam describes Jason as a brilliant writer and editor and one of the humblest people he has ever met. Jason describes Adam as an exceptional salesperson, with a unique ability to interact with people and someone who is singularly focused on achieving his goals. The two shared an enthusiasm and motivation for working toward a common goal so, GuidePoint Media, the parent company of MSDynamicsWorld, was formed. After the idea was conceptualized, it took about 6 months to prepare for the launch of MSDynamicsWorld. To bootstrap their venture, the new partners pooled their savings - even selling Adam’s car to raise funds. The emotional and moral support provided by their families during this time was key. Jason built the complex site infrastructure; Adam took charge of developing the lead generation programs. Jason’s father, David Gumpert, used his journalism background to develop content and recruit writers. While content was the backbone of the site, every decision was made with the marketer in mind, everything being somehow tied to potential lead generation for Dynamics ISVs and partners. Before they could sell any lead generation programs the site needed a membership base. They knew they didn’t have time to rely on SEO and organic traffic. So, the team started contacting bloggers in the Dynamics space, many of them MVPs, and convinced them to post content with links to the new site. They also invested a large amount of money in Google Adwords campaigns. It paid off and soon they had several thousand registered site members. At this point the two were working 20-hour days and focusing on the new venture on nights and weekends. After about six months, they took the leap of faith and quit their “safe” jobs to focus on MSDynamicsWorld full-time. Adam started cold calling again. It was challenging because the site had no ties with Microsoft and Adam was asking Dynamics partners not only to trust in them, but also to buy into a completely new concept. The first person who took a chance on them, was Heather Robinson, who at the time worked as Scribe Software’s marketing director. Heather was the first to believe in the concept, and will always hold a special place in their hearts. Fast forward 10 years and MSDynamicsWorld now works with 165 Dynamics ISV partners each year on lead generation programs. The site has 65,000 active registered users consuming content on a regular basis. 65% of the users are senior level executives. More than 80 writers regularly publish content and 95% of the content is developed exclusively for MSDynamicsWorld. MSDynamicsWorld hosts over 200 sponsored webcasts per year which generate over 15,000 sign-ups. And their latest idea, the MSDynamicsWorld Podcast, has had over 15,000 listeners this year alone. The site was profitable in its first year and has been every year since then. As editor-in-chief, Jason oversees all editorial content on the site and at events. Adam focuses on sales and lead generation programs. Together they provide site management and strategy. Adam and Jason won’t allow themselves to sit still and get too comfortable with their success. They are constantly obsessing over what more they can do to improve their services and benefit customers. These two entrepreneurs knocked on the door of this channel 10 years ago with no direct relationships and no connection to Fargo or Microsoft. They both feel grateful that they have become a part of such a vibrant community of Microsoft Dynamics customers and partners. Congratulations to this team on their tenth anniversary. 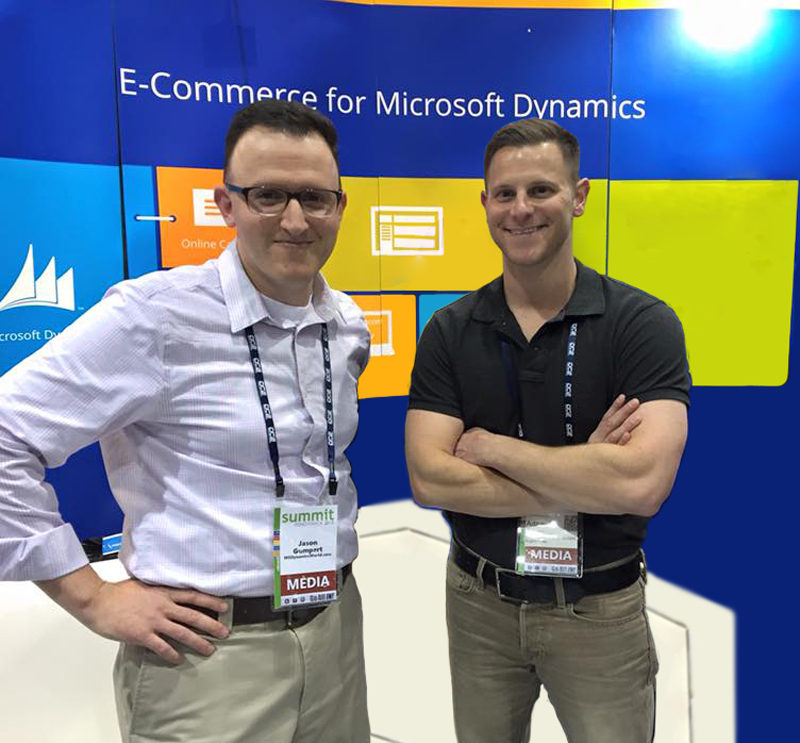 No doubt MSDynamicsWorld will continue to grow and provide value to the Dynamics channel into the next decade. Read more in the Backstory Series.